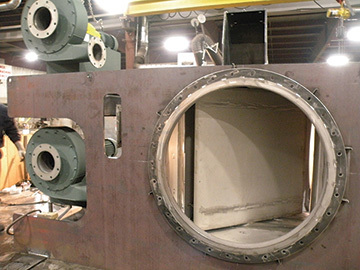 Solutions for specialty gas-flow equipment - Bachmann Dampjoint Inc.
On numerous occasions, Bachmann Dampjoint has custom designed and manufactured specialty dampers that are outside of the conventional damper categories. Keeping the exact requirements of the client in mind, Bachmann Dampjoint has designed the appropriate equipment to meet the special needs of every client. 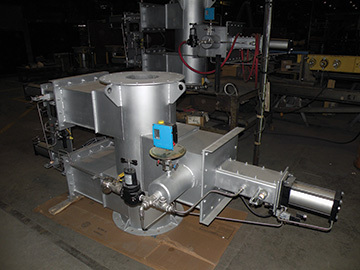 Among the general groups of specialty products are the following equipment: flow diverters, bypass systems, stack caps, vacuum relief caps, backdraft, emergency, hurricane and bleed-in dampers. In addition, refractory-lined, water-cooled and high nickel alloy dampers are other examples of specialty products developed to satisfy high temperature, abrasive or corrosive conditions.